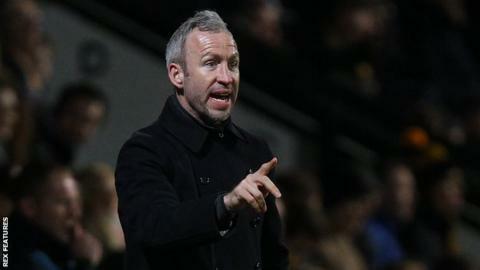 Cambridge United boss Shaun Derry has criticised the personal abuse towards him in Saturday's home loss to Exeter. The 1-0 defeat saw the U's drop to 13th, but there is just a three-point gap to the League Two play-offs. "I understand everybody's frustrations. I can't, however, accept the abuse that came from one or two individuals from behind me," said Derry. "I'm not stood there on the sidelines to take that abuse, not for the amount of work that I put in for this club." He added to BBC Radio Cambridgeshire: "So think hard what you've said to me the one or two gentleman sat behind me, because I'm not accepting it." The defeat was Cambridge's first at home since 2 January, but a win would have moved them level on points with AFC Wimbledon, who occupy the final play-off berth. "That was a real poor performance for us. It came out of the blue, especially after Tuesday night [a 1-0 win against Wycombe]," said Derry. "But let's not take anything away from an opposition who have come here and started absolutely fantastically well, controlled the whole game. "We could never find a Plan B or C to combat them. Once again we have to take our medicine and look forward because that's the nature of the beast."